Sometimes you want to eat something decadent. Adultish. Sometimes you want to share with your husband, and sometimes you want to make it at 11am and eat it all by yourself while watching a movie on the Hallmark Channel. I didn't even try to light this properly and attempt a nice picture. Instead, I removed the stoneware from the base, wrapped it up in a beach towel, grabbed a sleeve of crackers and plopped on the couch in front of the TV. When Adam or the kids got near, I snarled and batted them away with my arm. This couldn't possibly taste any better. serves 1 mom unless she feels like sharing. then it will feed more. We are about 8 weeks into this school year, and it's been a doozy, schedule-wise for our family. I have three kids, at three different schools, and they each have their own sport. I've tried to limit our activities, I really have, but figure they each can do one thing. That shouldn't be too much, right? Well, it sometimes feels like WAY TOO MUCH, which is why I love Thursdays so much. We are all home. Nobody needs to go get picked up in the 8 o'clock hour, which means I can change into jammies and chillax from about 6 pm on. and I relish in it. Adam and I have been trying our hardest to shuffle the kids off to bed somewhat early so we can binge watch Netflix (current fave is Nurse Jackie) and eat something "adultish" without the kids. If you'd like to join us, we are having yummy, ooey brie tonight. serves 2 and only 2. You have two choices here: you can use a 2-quart slow cooker or you can use a 6-quart slow cooker with an inserted oven-safe dish. If your brie has a really hard rind, cut the top part off. 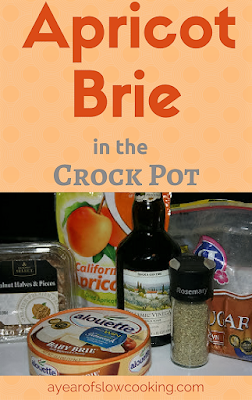 Put the brie into the crockpot (or the oven safe dish). In a bowl, mix the chopped apricots, balsamic vinegar, brown sugar, water and rosemary together. Spoon on top of the brie. 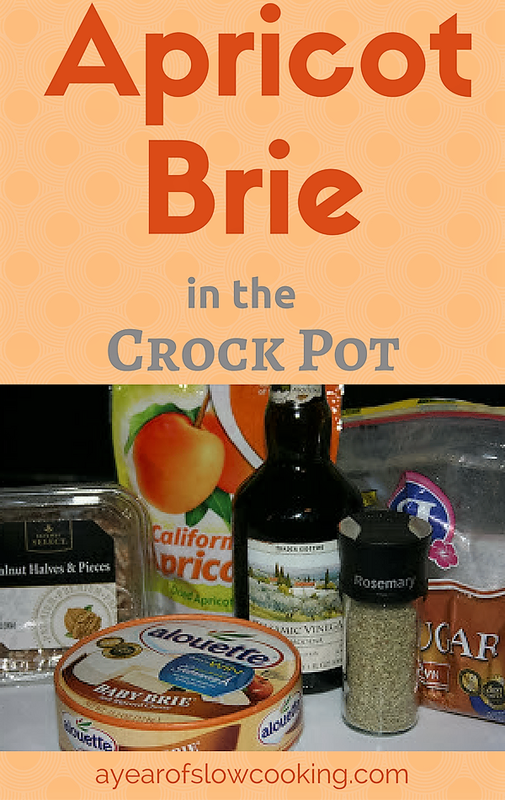 If you are using an inserted dish with the brie in a large crockpot, you do not need to add water around the base of the dish. Cover and cook on high for 1-2 hours, or on low for about 3. Check after an hour just in case. When the brie is warm and as melty as you'd like, take it out. You aren't really cooking anything here, just melting it nicely. I eventually shared with Adam. We had it as dinner. The flavor is so amazing, and the brie got so gooey and amazing. I think I just drooled a bit. Yum! I am salivating as I write this... can't wait to try it! Love the "batting them away" image! This sounds fantastic. My mouth is watering! I'll have to see what oven-proof little dish I have that will fit into my crock. I recently found some crackers that have neither gluten nor soy, and I've been making up for lost time after many crackerless weeks. I usually just dump a bit of apricot preserves on top of my Brie. This sounds like a "fancier" alternative! Hi Quinn, what is the brand of the crackers you've found? I usually get the rice crackers, or the Blue Diamond almond thins. Can you do this in the little dipper? you won't be able to use such a big piece of brie. If you have a smaller wedge, it will work, and then cut the topping in half. The Little Dipper says it only holds 1 cup---but I've found that it holds close to 2. Wow. That sounds amazing! I'll be making that for Thanksgiving for sure. Today, you are the subject of my post and a link to your site. What a determined person you must be to stay with your crockpot, this way. Ooh, this sounds yummy! I have a simiar recipie but made in the oven in little pie crusts in a mini-muffin tray. Only calls for brie and apricot jam, but I bet the walnuts and balsamic vinegar will liven it up a bit. Ok, I have a confession. I bought a crockpot yesterday. I already have a crockpot, mind you, but it's ginormous, for my ginormous family. I got myself a wee little cute one so I could make yummy recipes like this one. And the pumpkin pie dip you posted earlier was FANTASTIC!! Okkkkk.....that is just tooo funny.. But then I love brie too, so I might be just as bad....I will have to give it a try and find out...LOL...thanks for the smiles. My sister an i microwave jam and brie. gross sounding and kind of pathetic, but it works for us. I think i could live on only varieties of cheese and crackers! Yummy! I make a baked brie for holiday parties, A round of brie, with a mixture of apricot preserves, craisins, and walnuts smeared over the top, then wrapped in puff pastry and baked. . .It is divine! Can you "bake" puff pastry in the crockpot? This...is one I'm going to make, when I'm all achy, and needy, and feelin' blue. And...I'm hogging it all........for medicinal purposes! Mmmmm. I've never tried brie...but this may just do the trick. Thanks!! BTW, I love your site! I've really wanted to try your various brie dishes recently, but haven't done it yet because when I went grocery shopping for brie I was shocked at how much it cost, and I shop at a discount grocery store! I'm waiting until I find a coupon so I can go buy it. Does anyone here know of a place I can get brie a little cheaper? This sounds wonderful! Great appetizer idea also. How are the Diamond Almond Thins? I have been meaning to grab some for my DS...but keep forgetting. this sounds real good, I bet you can use other dried fruit as well like dried figs or cranberries. This will be a treat around the holidays. This looks absolutely divine, and super-easy for parties. Can't wait to give it a whirl! I loved this! I made it and ate it for dinner - and for midnight snack. And then made it again at a friends for movie and wine night. SO GOOD! What a great website! I just found it and have to bookmark it so I can come back and make your yummy recipes. Thanks! I finally made this after drooling over it for quite some time, absolutely deliscious!! Do you think I can make this and then travel with it for an hour to a holiday party? Does it need to be served fresh? I'd recommend getting it ready at home, and putting it in the crockpot to travel, and then plug it in oh high at your destination. Brie is fine getting up to room temperature, and then it shouldn't take that long to get melty. This looks amazing! I'm planning on making this on Sunday for a get together with my parents and my husbands parents. I'm going to use an oven-proof insert, but will that affect the cooking time? My 1.5 qt only has one setting, so I was figuring it would already take 2-3 hours without the insert. What do you think? Thanks so much! You have created a mecca! Hi Sara, it might take a bit longer, but not much---just long enough for the inserted dish to get as hot as the crock, maybe another 20-30 min. WOW is all I have to say! I stumbled across your blogs the other day in a search for a crockpot taco soup....I am now officially ADDICTED to your crockpot blogs. Seriously. I have found myself getting lost over the past couple days in all you have to offer! My crockpots will never be the same again! Not just for chilis and stews anymore! (Which I despise btw...stew, not chili). Anyway, back to the brie. AMAZING! I read on one of your soup recipes I think it was, that it tasted like 'a bowl of Autumn' (or something like that). I now know exactly what you meant by that. THIS definitely did and it was made on such a perfectly cold (39 degrees at 2pm...in SEPTEMBER!) day. I have never liked brie until this recipe (mind you, I've only ever tried it cold on crackers). But I couldn't pass this up and had to try it right away. B/c I've never been a huge fan of brie, I had the idea to cut down on the amount of brie but keep the same amount of topping (thinking to me it would be all about the topping). I now regret that decision b/c my brie pretty much all 'gooed' down and mixed up with all of the topping. Don't get me wrong, it was still DELISH, but any little bit of non melted down brie that I did get, made me want MORE! Next time I will use the entire amount of brie and probably stop it right at an hour (I let mine go for just over 2). I can't wait to make this as an app for the next ladies night! THANK YOU STEPHANIE!!!! I have read this posting before, and still chuckle over the snarling at the hubby. I love apricots and the easyiest jam alive is cover dried apricots with water, cook on low until water is absorbed. Dump one can of crushed or chunk pineapple in and stir. Refrigerate and enjoy a good iron rich jam that your body will absorb because it is paired with a fruit/citrus pineapple. Loved the GMA chicken and missed the show, but saw it on the web. You are one foxy hippie! I am going to make this at my next potluck! Could crackers be used with it too? definitely! If you aren't gluten free, any favored cracker will do. If you are, the new Nut Thins by Blue Diamond are great, as are tart granny smith apples cut in slices. This looks fabulous! Do you think it would be worth making without the walnuts, or would it lose too much flavor? I love them but Oldest Kid is allergic. leave 'em out---no problem whatsoever. They mostly provide texture. i'm allergice to walnuts, can you use almonds instead? Absolutely! Use what ever nuts you prefer, or keep them out all together. I'm making a spinoff on this recipe. There are three or four wedges of brie jammed into the bottom of my 7 quart crock pot thawing overnight. I've also got dried cranberries with the water, balsamic and rosemary in a bowl in the fridge rehydrating overnight. Those will go on top of the cheese tomorrow with the walnuts on top. The ratios are all different... especially since I didn't measure anything... but I've got a lot more people to feed. We'll see how it goes! Wow. I don't think I've made this universally loved in years. I tweaked your recipe a little, swapping dried cranberries for the apricots, skipping the sugar, and eyeballing the topping. I used a much lower ratio of topping to cheese also -- I probably used about as much fruit and nuts as you did, but I used four wedges of cheese, entirely filling the bottom of my 7 quart crock pot. I sliced up a loaf of rosemary olive oil bread, a loaf of roasted garlic bread and some plain baguette as well as including soda crackers on the platter of bread, and cut up some winesap apples. I'll try to put up a photo of it at my livejournal tomorrow. I made this for guests and it was excellent. Perfect size for appetizer for 6 people. I had to use brie triangles, cut up and arranged, as my grocer did not have the brie wheel. It came out great. Very happy with this recipe. I should mention that I served this with crackers -- All Bran Fiber Crackers (really good, kinda like wheat thins) and melba toast crackers were the best. I made this and something didn't turn out right. Is all brie created equal? How do you know you have good brie? Because I don't think it was the topping, I think it was the brie. And I have had brie before, but I have never bought and used it. Will definitely try again. Maybe I will go with trader's joe's brie. I think I will also cut all the rind off. Stephanie, do you have any suggestions for adapting this recipe to work in my 6qt Smart-Pot? Maybe I could put the brie in a smaller ceramic dish within the Smart-Pot? Absolutely! I use a pyrex or corningware dish---anything that is oven-safe can go directly into the crockpot insert; no water needed. Made this dish for my book club meeting on Thursday night & it was a hit with everyone, and so easy too! I'm thinking about using cranberries next time or a mixture of apricots and cranberries. I'll let you know how it turns out. Tried this again with just dried cranberries and my friends & I both agreed we like them better than the apricots. Thanks again! Hi, I'm looking for an appetizer to bring to an anniversary party next weekend. Do you think I could make this in a 3 - 4 qt. crockpot and double it? Do you think it would still turn out fine? Any thoughts as to what I should bring to serve it with besides crackers, or will that just be good. I actually came to your site today to find a main dish crock pot thing to make but this sucked me in and I want to try it! Thanks! Someone just forwarded me this recipe. I'll probably make a few adjustments but the idea of using a crock pot for it is awesome! A friend (and avid follower of your blog) who passed away recently served this dish at a Mother's Day luncheon a couple years back. Phenominal. Thank you so much for bringing a happy memory of her to mind by mentioning it. Enjoy your holiday weekend. BTW, her name was also Stephanie.